I am always trying to stay up to date with what is the latest and greatest in the produce world. 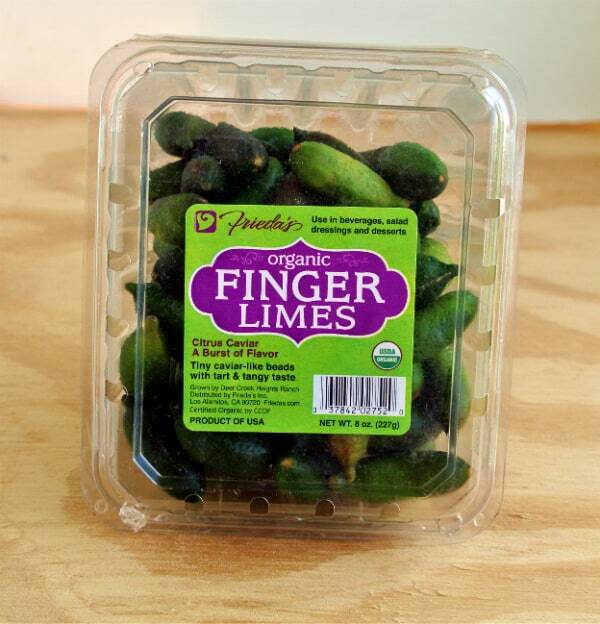 So when Frieda’s produce offered to send me some organic finger limes, I was all over that! Finger limes are one of the “it” items of this year. They originated in Australia. They are now starting to be grown more in the United States. The particularly ones I got were grown by Deer Creek Heights Ranch out of Terra Bella, California. They are organically grown – certified by the USDA. So what’s so special about these limes, besides them being so small, which I didn’t realize from the pictures I saw online. Yeah on the outside they look like really tiny, elongated limes. But when you open them it’s a whole different experience. It’s best described as citrus caviar. The vesicles inside the fruit look a lot like caviar. How cool is that? What’s even cooler is they can range in color from bright green to rusty red and the vesicles from white to pink. They have the tart and tang of a lime. I don’t think they are so tart that you can’t just pop them in your mouth, like they were Pop Rocks. They crunchy liquid fills balls. That is what really amazed me when I first tried them. I was expecting them to be softer. I do like that the “caviar” are firm enough not to just burst when you touch them. Besides just popping them in your mouth they have other uses, which I am excited to explore myself (recipes coming soon!). You can toss them in salads, desserts, in beverages, or anything you would like to add a citrus bite to. They work great as a garnish. 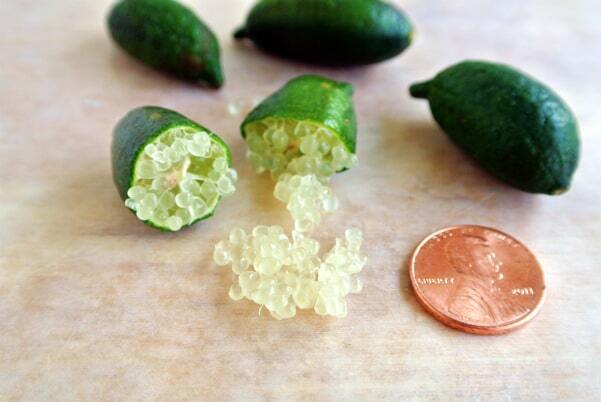 When Are US Organic Finger Limes in Season? Frieda’s began shipping them this year in July. They expect to have a supply through December. This is really the first year they will be more widely available, althought keep in mind quantities are still limited. This is a really new crop to the U.S. I will try and keep track of places you can buy Finger Limes. You can download a $1 off coupon from Frieda’s to use on the finger limes. So glad you like them! So many things to do with this lovely micro-citrus. I had people put some in their beer over the weekend. Pretty neat. Wow – I don’t think I’ve ever come across these before – glad to have stumbled on your blog!